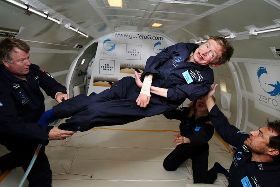 Stephen Hawking was born in Oxford, England on January 8, 1942. He grew up in a highly educated family. Both of his parents had attended Oxford University and his father, Frank, was a medical researcher. Stephen enjoyed math and science in school where he earned the nickname "Einstein." He wanted to study math at university but Oxford didn't have a math degree at the time so he chose physics and chemistry instead. Stephen found college coursework to be very easy. He enjoyed being a member of the school's boat club as well as classical music. After graduation, he went to Cambridge to study for his PhD. 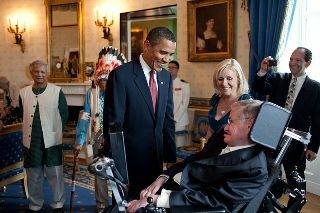 While Hawking was working on his PhD at Cambridge University, he began to have health issues. His speech became slurred and he became very clumsy, often dropping items or falling for no reason. After going through a series of tests, doctors discovered that Hawking had a disease called ALS (also called Lou Gehrig's disease). At the time, the doctors said he only had a few years to live. Although Hawking was initially depressed over his diagnosis, he decided that there were things he wanted to accomplish with his life. He began to study and work harder than ever before. He wanted to earn his PhD before he died. Around the same time, he met and fell in love with a girl named Jane Wilde. Between his work and Jane, Hawking had a reason to live. Despite the initial grim diagnosis from his doctors, Hawking has lived a full and productive life with the help of science and modern medicine. Although he is confined to a wheelchair and cannot talk, he can communicate using a touch pad computer and a voice synthesizer. Stephen spent much of his academic work researching black holes and space-time theories. He wrote many important papers on the subject and became a noted expert on relativity and black holes. Perhaps his most famous theory was one that demonstrated that black holes emit some radiation. Prior to this it was thought that black holes could not get smaller because nothing could escape their enormous gravity. This radiation from black holes has become known as Hawking Radiation. You can go here to learn more about black holes. Stephen also enjoyed writing books. In 1988 he published A Brief History in Time. This book covered modern subjects on cosmology such as the big bang and black holes in terms that could be understood by the average reader. The book became very popular selling millions of copies and remaining on the London Sunday Times best-seller list for four years. He has since written many more books including A Briefer History in Time, On the Shoulders of Giants, and The Universe in a Nutshell. He was born on the 300th anniversary of the death of the famous scientist Galileo. Stephen has been on several TV shows including The Simpsons and the Big Bang Theory. The book A Brief History of Time only has one equation, Einstein's famous E = mc2. Hawking has co-written several children's books with his daughter Lucy including George's Cosmic Treasure Hunt and George and the Big Bang. He received the Presidential Medal of Freedom in 2009. He hopes to travel to space one day and has trained with NASA on their zero gravity aircraft.